In 2011, the town of Leutkirch in the Allgau region has been given the title "Sustainable Town" and membership in a pilot project of the energy provider EnBW, containing new concepts for sustainable and independet concepts for energy production and supply in communities. The builder of a new administrative building in Leutkirch, Leutkircher Bank eG, followed this local trend by emphasizing the environmental sustainability of the construction. The building was erected on a former fallow ground next to the train station, which gave the whole quarter an uplift and turned it, together with additional renovation works in the train station, into a showcase quarter of the town. Completed in 2014, the building features 20,000 m³ of construction volume and 3,600 m² of office space. Highly insulated walls and windows, modern photovoltaic technics with combinated heat pumps and an intelligent surface heating system result in lower energy consumption and costs. Lindner Heating and Cooling Technologies were the systems of choice for the energy-saving temperature control. 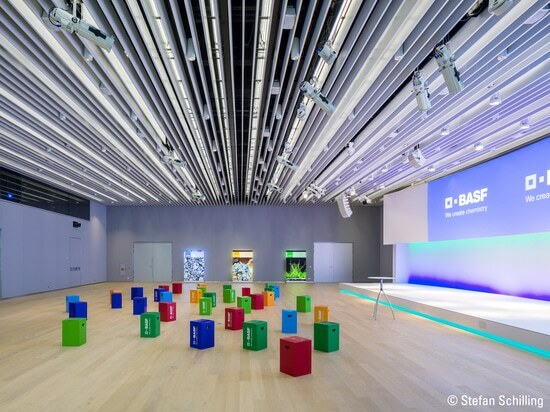 The Hook-On ceiling Plafotherm® E 200 was installed at a quantity of 1.000 m². Thanks to the overlaping installation of its panels, LMD E 200 acts as an "all-rounder" in this range: widely adaptable both in regard of funtionality and appearance, with a span up to 3,300 mm and easily accessable for installation and revision works. Apart from heating and cooling technologies, frameless lights can be integrated in the system. Lindner Canopy Ceilings of the type Plafotherm® DS were also installed in the building and principally serve the same purpose as the E 200 systems. The large format canopy ceiling DS 320 is expandadable on the short side but can also be variably arranged as single panels which are available in many different shapes and dimensions. Because of its angled edges, the canopy ceiling has a filigree appearance and can be adapted individually with many eye-catching surfaces. 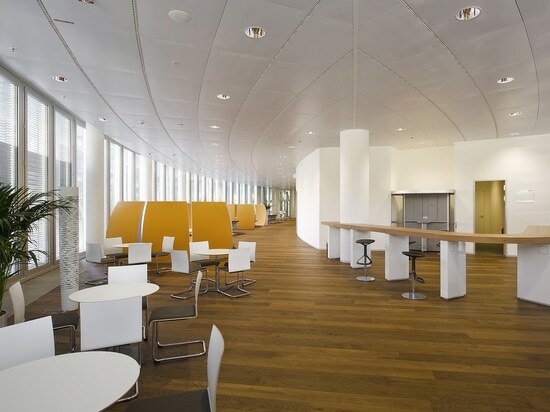 Sophisticated sound absorption is achieved with acoustically effective inlays. 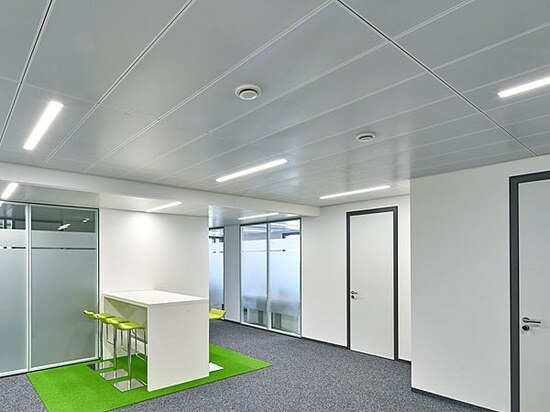 In addition, recessed and surface-mounted light fittings can be easily integrated. No matter what demands will be required from your ceiling, Lindner can offer the perfect solution. For functionality as well as style; from concealed to fully accessible and swing-down ceilings. Lindner Ceiling Systems: the perfect finish. Lindner Ceiling Systems: the perfect finish. The right wall for every room. 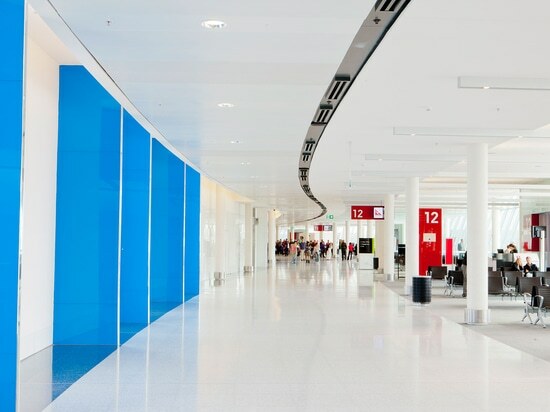 Irrespective of whether you are interested in glass, wood or metal – with Lindner glazed and partition walls there are no limits to what you can do. Lindner Partition Systems: solutions for a balanced surrounding. Lindner Partition Systems: solutions for a balanced surrounding. The product ranges LMD Baffle Ceilings and Plafotherm® Heated and Chilled Baffle Ceilings have been unified and completely revised. Lindner's proven Heating and Cooling Systems create a healthy indoor climate in every kind of room by sharply improving the wellbeing at work and the human capacity at the same time. Lindner Heated/Chilled Ceilings: efficiency can feel so well. Lindner Heated/Chilled Ceilings: efficiency can feel so well.